I was wondering a couple of things . Firstly why is it recommended to do a 25 percent water change ? Is there any reason why for example you could do a 30,40,or 50 percent water change weekly . I wondered this because my tank is only small 22 litres I'm getting biofilm on the water after about day five after a water change . I think this is mainly because I have minimal flow from the pump and not much surface agitation . Because I have a betta. Or is it a sign that my filter needs changing ? The company that makes my tank recommend changing the filter cartridge every 8 weeks , the sponge and ceramic media every 16 weeks . I'm due to change the filter this weekend and the sponge and ceramic media weekend of the 18 th . The sponge looks in pretty good condition but I'm concerned about changing the sponge and ceramic and the same time ? Re: 25percent water changes why this amount ? I think the ~25% weekly change is usually advocated because that's what people generally find is needed to keep their ammonia and nitrite at 0ppm and their nitrates under 20ppm. It is my understanding that too large a water change (esp over 50%) could risk causing a mini-cycle / loss of too much good bacteria in the process, although someone else may be able to confirm if this is the case. If you were finding difficulty in keeping water at the levels of ammonia and nitrite at 0ppm and nitrates under 20ppm, then larger and/or more frequent water changes should address that, so that's why it's so important to monitor those weekly just before a water change so that you know what they tend to be - and monitor more frequently if you make any changes to the tank such as add fish, feed something different, do smaller/larger water changes, add/remove filter media, etc. By biofilm (which is generally good ie the good bacteria which is on the internal sides of the tank and on the decor), do you actually mean the slightly oily look on the water surface? If so, this is more likely a build-up of fats (etc) from the food. If you don't like it, you could always do two water changes per week. Be careful about changing the filter media - filter companies often recommend this despite it being unnecessary, and it can induce a mini-cycle (and therefore ammonia, nitrite and nitrate spikes). Although it does recommend splitting those, the key rule of thumb with changing filter media is not to change more than 30% at a time and generally to leave about a month between any further changes to give the good bacteria a chance to re-grow/build up. If the sponge isn't falling apart (just stained), then I would not change it but simply just gently squeeze it in old tank water, to avoid losing too much bacteria. If/once it's at the stage of falling apart, then you could consider cutting it and removing/replacing a third of it, then perhaps in a month's time, removing/replacing a third of the ceramic media, etc. If you let us know what filter you have, though, we may be able to advise further and more specifically. I have the Marina i110 filter (take a look at it to see if it's similar to yours), and it only allowed the complete replacement of the cartridge, not a partial replacement, so I ended up converting it over to purely sponge media which has made it a lot easier. If yours is similar, I can advise in more detail how to go about that. FCMF beet me to it but... I would not recommend changing either media that soon and certainly not both at once. You can take the sponge out and swill it out in dechlorinated water to remove any loose solids (the water you remove from the tank in a water change would be fine), otherwise you risk loosing all the beneficial bacteria that you have built up. A small air stone would remove the film on the surface in 15/20 mins - you could set only on a timer post feeding for best results. Don't worry about what the manufacturer's recommend, its a bit like printer cartridges, they are just trying to sell more!! I too never change my media. I have sponges which I squeeze in tank water taken out at a water change, and Eheim substrat pro, sintered glass balls this company uses instead of ceramic media, and I just swoosh the baskets up an down in old water. Some small filters have cartridges made of a sort of fabric on a frame with carbon inside. Carbon gets full after a week or two which is why that does need replacing - but as you don't actually need carbon, if you have one of these in the filter the best thing is cut a small slit in the 'fabric', empty out the carbon granules then stuff it with sponge. Then just squeeze the debris out in old tank water. I feel the sponge is ok as its sort of a wiry sponge so not falling apart . I rinse this in old tank water every week . The ceramic balls are in a slide in cartridge and look ok at the moment , it's the carbon filter cartridge that I feel needs changing at it gets full of black stuff . I also give that a rinse In Tank water every week. These are all in a separate compartment at the back of the tank. I remove them and Hoover underneath where they are because gunk accumulates under there. I really don't understand what airstones do , or how they work . Do I need a separate pump ? I test for nitrite every week before a water change and it been at zero ever since I cycled the tank , so I'm hoping I'm doing something right ! Meant to say yes its oil on the surface . Then a small section of air pipe and an air stone - both available for pennies. I have a couple of those small air pumps, and would certainly recommend them as they are so quiet compared to others. I clicked on the Amazon link . Still don't under stand it doesn't look like there is a pump / filter that connects to the electric . Do I connect the tube to my pump / filter ? In the second image in the Amazon link it shows the pump with a wire going out the bottom which has the plug on the end. Coming out the top is the air line tubing - in the background you can see the tubing (only) then goes into the tank with the air stone on the end. In going to the aquarium shops today so will see if they have one like this at a similar price. So I will then have this and my normal pump/filter working at the same time correct ? Is this air stone similar to the bars I've seen used in large aquaruims ? Yes it is. The air stone in the links is a small ball, the ones in big tanks are a long strip which need a more powerful pump to run them. You wouldn't need to run the airstone full time, Matt suggested using a timer to turn it on for 15 to 20 mins after feeding to break up any oily residue from the food. As a side point, air pumps can be used to power sponge filters which are very suitable for bettas and fish fry. Earlier this year I swapped the internal filter in my betta's tank for an air pump powered sponge filter (cycled it first in the quarantine tank) and I am very pleased with it, and the different way my betta now behaves. Excellent point Sue. APump do a silent air pump like this with filter add on which always gets excellent review (whilst being a little pricey). This would mean just running the air powered filter all the time and the internal filter could be removed (after the new filter has seeded of course). Well I got a small air stone and set it up , but I think it's too bubbly for my small tank ! It's breaking up some plant leaves and stirring up the dirt ! I may just be putting it on as Matt suggested after feeding for 15-20 mins . It's wreaking my peacefull tank ! Moonbeam is not a happy boy ! Also got the root tabs and the hikari bio gold betta pellets . I never heard of an airstone dammaging plants... try putting the airstone nearer the surface to minimise any disruption. All the man in the shop said there is a clip that you put on the tube that squeezes it to reduce the flow , so I can get that online if I could remember the name of it . Or wait until I get back to the shop . Maybe I have it too low in the tank I've moved it away from the delicate plant and put it under a few pebbles . Will keep trying until I get it right . All the man in the shop said there is a clip that you put on the tube that squeezes it to reduce the flow , so I can get that online if I could remember the name of it . 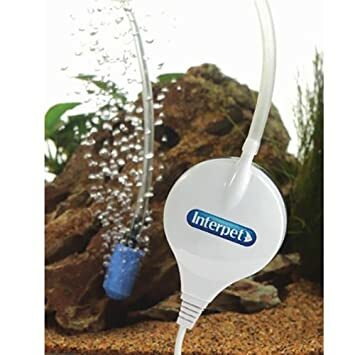 I have done just what Paddy describes, I use a spitter in the air line between the pump and the sponge filter for my betta's tank. My reasoning is that constricting the tube to slow the air flow will put pressure on the pump while bleeding some of the air into the room won't. I've placed it between the pump and the non-return valve and just turn the lever on the venting side till the flow in the tank is what I want. Can I ask where you got the valve ? I have been using the air stone after feeding but now it's caused really cloudy water ! I have never had cloud water since I set up the tank ! I did a water change yesterday but now feel I've got to do another . It must be something to do with the stone ! I've removed it now . Why has it done this ? Is it going to harm my fish ? Re what's causing th cloudy water ? The only other thing I've done different other than the air stone was give moonbeam new betta pellets, which he spat out , and put three root tabs in , and add the air stone so it's one of these few things ! Please help I'm worried about the fish . I've got a 5.5 litre bucket ready to do a water change . I got it off Ebay, which I know you aren't keen on. From this seller, though I see it's gone up 50p since January. There are lots of other sellers with similar, if not the same, splitter. What to look for is a 2 way splitter as you don't need any more outlets than that, and ones with levers to control the air flow, not the kind that don't have them. Just noticed a lot of sellers call them airline manifolds rather than airline splitters - the latter include the non-lever types. If the water is cloudy a water change will do no harm and might well help. Did you bury the bubbler under the substrate? If you did, it could well be kicking up some mess caught in the gravel. I would put it on top of the gravel hidden behind something. check your water levels for ammonia and nitrite and pH. If all ok, unless there are any fish with obvious signs of distress, I'd monitor the tank for now and not make any more changes. If you still have the old food I'd go back to that just now. Keep the amount of changes you make to a minimum. The issue could be one of these changes or a combination of two or three. EDIT: agree with Sue, water change won't hurt. It would help with the cloudiness. I've done two 25 percent water changes today . It has helped but not completely cleared . Should I do the same thing tomorrow ? I would, until you know the cause of the cloudiness. It is possible that the airstone kicked up some mess off the bottom of the tank/in the substrate in which case it could have caused a bacterial bloom. Bloom bacteria are not the same kind as we grow in the filter, they live on organic matter and any mess on the bottom will contain fish poo and uneaten food which are organic = food for bloom bacteria. They live in the water column and multiply so fast we can see them as the cloudiness. Bloom bacteria don't harm the fish directly, like ammonia and nitrite do, but they can use up a lot of oxygen in the water. This can be a problem for most fish but not bettas. They evolved to live in oxygen depleted, stagnant water and they can get oxygen directly from the air. The good news is that once bloom bacteria have eaten all the organic matter in the water, they die and the bloom goes away. Provided there is no ammonia or nitrite in the water the fish won't come to harm. But water changes will stop the cloudiness getting worse. Ally I must say I feel terrible that your tank is not as you would like following the installation of your air stone as I recommended. Perhaps you could describe in detail every recent change you have made to the tank and post photos so that I may help diagnose the problem? Topics that relate to "25percent water changes why this amount ?"